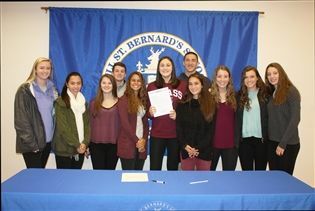 Yesterday morning, Alexia Allesch '17 signed a National Letter of Intent with the University of Massachusetts—a Division I school—to play girls' basketball next year. 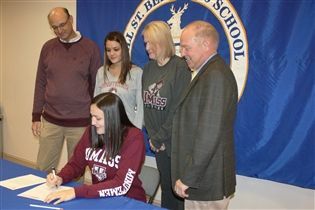 Allesch's family, friends, fans and coaches came to Brueckner Hall to watch the signing. 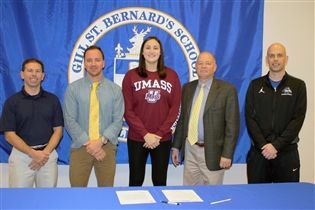 Allesch has been a contributor to the varsity girls' team since her freshman year. 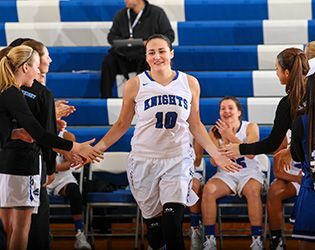 During that time, the forward has racked up 681 points, 535 rebounds, 184 blocks and 113 steals and helped the team to Somerset County Championships and Skyland Conference Division Championships. Aaron Gratch, head coach for girls' basketball, said "Last season, Lexi was a huge piece of the team. Everyone looks up to her. I was very happy to see her find a school that is such a great fit. 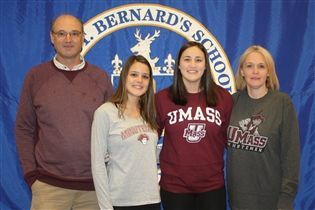 UMass has a great program; Lexi will be very much at home there and will be able to make an immediate impact."